Artist: © Kow Yokoyama Source: "Messerschmitt Bf.109G-6". Modeller's eye series 3. Special Edition. ISBN 4-499-22782-8. Bf.109G-10/R-3 Unit: 10./JG 51 Serial: 5 (W.Nr.130297) Pilot - Fw. Horst Petzschler. Flew this a/c he escaped to Sweden on May 4th, 1945. Profiles and Photo Data: The G-10 was an attempt to match the proven Bf 109 G-6/G-14 airframe with the new and more powerful DB 605D engine with minimal distruption of the production lines. Despite what the designation would suggest, it appeared in service after the G-14 and somewhat the K-4 in November 1944. Early production G-10s used fuselages taken from the G-14 production lines, this was probably a source of confusion as many authors still believe many G-10 were based on recycled G-series fuselages. The most recognizable change was the standardized use of the 'Erla-Haube' canopy, sometimes referred to (incorrectly) as the 'Galland' hood. This canopy improved the pilot's view by reducing the number of support struts, which was often criticized before. The G-10 was produced in very substantial numbers, with some 2600 G-10s produced until the war's end. The Bf 109 G-10, AS-engined G-5s, G-6s and G-14s as well as the K-4 saw a refinement of the bulges covering the breeches of the cowl mounted MG 131, these taking on a more elongated and streamlined form, barely discernible on the upper sides of the cowl panels, as the large engine supercharger required a redesign of the cowling. Our morale in combat was unbroken and when the weather permitted, we flew many sorties each day. Comparatively speaking, the English were in the better position in that they fought over their own territory and thus could save themselves in an emergency by baling out or carrying out a crash landing. In contrast, if we found ourselves in such circumstances, we had to count on being captured or risk landing our damaged aircraft in the Channel. In a dogfight during August 1940, my radiator was shot-up, causing the engine cooling system to fail and I had to turn off the ignition to prevent an engine fire. The Me109 1 had a glide angle of 13:1 2. which meant that with the engine stopped we could glide 13 kilometres for each kilometre of altitude. This occurred at an altitude of 4,000 metres over Canterbury, some 80 km from the French coast, so I knew I would never be able to glide that far and had to think of something new. From 4,000 metres I would be able to glide only 52 km at the most, then I would go down into the English Channel. Suddenly it occurred to me to allow the engine to cool during the descent. This I did and the temperature dropped quickly, so I restarted the engine and climbed at full throttle as high as possible until the engine overheated again. I did this repeatedly, climbing up and gliding down, until I finally reached the French coast and carried out an emergency landing on the beach at Calais. My report of this experience was distributed to the units and the method adopted. It later received the nickname 'gebobt' after Bob, my surname. Our missions over England continued, becoming progressively more difficult until, in the last part of 1940, attacks became impossible to carry out due to the severe weather conditions. The German fighter-pilots were still optimistic even though the daylight bomber operations had been cancelled. The British fighters did not even take off if there were no German bomber formations flying in the English skies. Thus we German fighters could fly around over southern England without contact with the enemy until we reached London. In order to lure the British fighters into the air, some of the Me109 squadrons were equipped with bomb racks. This was the birth of the fighter-bomber. As the Staffelkapitiin of 9./JG54, I had to carry out a test flight with a 250 kg bomb under the fuselage. The take-off, from a meadow at Guines-South, was quite risky since we fighter pilots had no idea how to handle bombs, how to hit the target, or how to operate the whole thing. In fact, the sortie was at first regarded as something suitable for a Himmelfahrtskommando, or suicide squad, but it proved worth the effort as the flight with the bomb was successful. Once in the air, I flew to a small spit of land extending from the English coast where I could release the bomb but exactly where it fell I could not determine as I really did not have the necessary experience. With time, however, and with improvisation - in order to dive at the correct angle, for example, we painted lines on the sides of the canopy - we achieved really good results. We then flew against England where our first targets were the airbase at Biggin Hill and Tilbury docks in London, where warships were being built. During all of our operations the radio communications traffic of the British fighter pilots were being intercepted. On one occasion3, an interesting conversation took place between ground control and a British fighter formation when ground control said: 'Attack the German bomber formations! 'The English formation leader shouted back: 'There are no bomber formations here!' Ground control: 'But bombs have been dropped' Formation leader: 'I see only Me-109s but they can't drop bombs!' Word quickly got around, though, that the bombs were being dropped by the Me-109 units with the result that air combat was resumed. 1. German pilots of the period referred to the Messerschmitt 109 as the 'Me-109' instead of the technically correct 'Bf109'. 2. Rudolf Rothenfelder of JG2 has stated that the ratio between height and the glide distance was 12:1. 3. Probably 20 September 1940. See main text for further details. Photo 01: 'Yellow 9' of Oblt. Hans Ekkehard Bob's 9./JG54. On 21 October, the entire III./JG54 moved from Guines to Holland where it was based on airfields at Schiphol, KatWijk, Haamstede and de Kooi. Between 4 December and 15 January, the Gruppe was recalled to Germany to rest and refit. Major Hans-Ekkehard Bob was born on 24 January 1917 at Freiburg/Breisgau. Bob joined the Luftwaffe on 1 December 1936 with the rank of Fahnenjunker. He spent his first year at the Luftskriegsschule Wildpark Werder undergoing six months of basic military training before commencing his flying training on 1 June 1937. At the beginning of 1938, he attended the Officer's Academy. Oberfähnrich Bob was then transferred Jagdfliegergruppe 133 based at Wiesbaden. His first operational missions came during the occupation of the Sudetenland flying with an Arado Ar 68 biplane fighter equipped unit escorting bomber and transport aircraft. Following the successful conclusion of the operation, Bob was transferred to JG334, equipped with Bf 110 Zerstörer twin-engine fighters and based at Gablingen, where he also received promotion to the rank of Leutnant on 1 September 1938. In July 1939, Bob was transferred to the newly formed 3./JG21, based at Jesau. On 6 June 1940, 3./JG21 was redesignated 9./JG54. He flew his first combat missions of World War 2 in Poland and France as a Schwarmführer (leader of four aircraft). On 10 May 1940, Bob claimed his first victory, a Gloster Gladiator biplane fighter shot down near Tongeren in Belgium. By the end of the French campaign he had recorded four victories. On 1 August 1940, Bob was promoted to the rank of Oberleutnant. He was appointed Staffelkapitän of 7./JG54 on 10 October 1940, replacing Oberleutnant Günther Scholz (34 victories, DK) who had left to lead III./JG54. However, his stay with this unit was short. On 28 November, Bob was appointed Staffelkapitän of 9./JG54, which he led until 1 August 1943. During the Battle of Britain, Bob's unit became one of the first fighter-bomber (Jabo) units. 9.Staffel mostly attacked shipping targets with 250kg bombs. By 11 November 1940, Bob had recorded 19 victories. Oberleutnant Bob was awarded the Ritterkreuz by Reichsmarschall Hermann Göring on 7 March 1941. On 21 March 1941, Bob undertook a flight in a Bü-131 (W.Nr. 4506) (BG+AB) training aircraft, which resulted in a ditching in Cherbourg harbour following engine failure. He survived unhurt. Staffelkapitän of 9./JG54 Oberleutnant Hans-Ekkehard Bob. Parndorf, March 1941. The rudder of his Bf109E shows 19 victories. Bob participated in the Balkan campaign, shooting down two Yugoslavian fighters: a Bf109 on 6 April 1941 for his 20th victory and an IK-2 on 9 April for his 21st victory. Following the conclusion of operations in the Balkans, JG54 was re-equipped with the new Bf 109F and relocated to airfields in East Prussia. On 22 June 1941, 9./JG54 flew their first missions of Operation Barbarossa, the invasion of Russia. Bob recorded his first victory in Russia on 23 June, when he shot down a SB twin-engine bomber. However, his Bf 109 F-2 (W.Nr. 9207) 'Yellow 1' + ~ was hit by return fire from the bomber's gunner necessitating a forced landing deep inside enemy controlled territory near Radviliskis. He managed to make his way back to German lines two days later. He was shot down for a second time on 13 July and was again forced to make an emergency landing this time near Borodkino. On 20 August, Oberleutnant Bob was again forced to make an emergency landing 50km south of Dno, when his Bf109F-2 (W.Nr. 12696) (Y1+~) received hits in the radiator. During a freie Jagd over the Volkhov River on 30 October, Bob encountered a Russian I-16 fighter. In the subsequent engagement, his Bf109F-2 (Y1+~) took hits in the radiator. He made a belly-landing behind enemy lines and was fortunate to evade capture. By the end of 1941, Bob had 39 victories to his credit. On 29 September 1942, he recorded his 50th victory. The sojourn in Russia ended for 9./JG54 on 12 February 1943, when III.Gruppe and 4./JG54 were ordered by the General der Jagdflieger, Adolf Galland, to change positions with units of JG26 based on the Western front. This tactical operation was cancelled, but III./JG54 stayed in the West and was separated from its parent Geschwader for the remainder of the war. On 17 April 1943, Hauptmann Bob claimed his 57th victory by ramming a USAAF B-17 four-engine bomber near Bremen. He was forced to bale-out of his stricken Bf109G-4 (W.Nr. 14935) (Y1+I). He suffered injuries in the incident. On 1 August 1943, Bob was promoted to the rank of Major and was appointed Gruppenkommandeur of IV./JG51 based on the Eastern front. He gained two further victories with this unit. 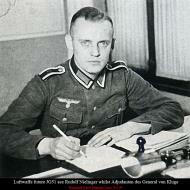 Bob was appointed Gruppenkommandeur of II./JG3, based on the Normandy invasion front, on 9 May 1944. He also led the unit on Reichsverteidigung duties. In August 1944, Bob transferred to Erprobungskommando 262 where he received very rudimentary training on the Me-262 jet fighter. At the beginning of 1945, he became one of the small team of experienced flying officers assigned to the staff of Generalmajor Josef Kammhuber. He worked on the staff directly responsible for allocating newly built Me 262s to operational units before being ordered by Kammhuber to Silesia. Here he joined I. and II/EJG2, both these units being responsible for training of former bomber pilots on to single-engine fighters. Bob next became a member of JV44; the Me-262 equipped unit led by the now former General der Jagdflieger, Adolf Galland (104 victories, RK-Br). At the capitulation on 8 May 1945, Bob was in Koppl, a small village near Salzburg. From there he walked 1,700km in 6 weeks to Celle. After the war Bob initially took employment as a farm labourer before establishing a transport business. In 1956, he founded Bohrmaschinen und Geräte GmbH (BOMAG) in Celle, manufacturing drilling equipment, which does business in 87 countries. He continued flying, establishing the Celle Flying Club. Remarks: His first known victory, a Soviet I-61 on 3 February, 1942. An Il-2 on 6 May, 1943. Two Il-2's on 7 May, 1943. A 5th, an Il-2 (m.H.) on 15 August, 1943. A 6th, a Yak-7B on 28 May, 1944. A 7th, another Yak-7B on 29 May, 1944. Remarks: 1 Bomber. This bomber may have been his B-17 victory in the Warsaw area on 18 September, 1944. 60+ Stormoviks, plus 25 unconfirmed victories. His first known victory, a Soviet Il-2 on 22 March, 1943. Three Il-2's on 10 June, 1943. A MiG-3, an Il-2 and a Pe-2 on 10 July, 1943, while serving in 1/JG-52. An Il-2 on 12 July, 1943. Five Il-2's on 13 July, 1943. Three Il-2's (all m.H.) on 25 July, 1943. An Il-2(m.H.) and a LaGG-3 on 31 July, 1943. A LaGG-5 and two Il-2's (m.H.) on 2 August, 1943. An LaGG-5 and two Soviet Hurricanes on 13 August, 1943. Four Il-2's (m.H.) in the Merepa-Podolychov areas on 14 August, 1943. Eight victories on 15 September, 1943. Two Pe-2's on 26 March, 1944. A B-17, Werk # 43-38175 'BI-S', piloted by 1/Lt Francis E.Akins, near Warsaw Poland on 18 September, 1944. Shot down five 'enemy aircraft' (probably Soviet type) on 16 February, 1945. His 178th victory, one of seven 'enemy aircraft' on 25 April, 1945. 420 combat missions, including 80 close support missions. One of the best fighter pilots of the younger generation, who was never shot down. Retired LW-Bundeswehr Oberst. Deceased 7 July, 2004. Gunther Josten wurde am 07.11.1921 in Rhynern bei Hamm geboren. Er trat im Januar 1940 in die Luftwaffe ein und kam als Uffz. am 01.11.1941 zur Jagdgruppe Drontheim, bei der es kaum Gelegenheit gab, sich beim ermudenden Kustenschutz auszuzeichnen. Ende August 1942 wurd er zur 3./JG51 an die Ostfront versetzt. Am 23.02.1943 konnte er seinen ersten Luftsieg erzielen, am 10.07.1943 schaffte er den 8.-10. und am 13.07. konnte er 5 Il 2 als seinen 12.-16.Abschuss zum Absturz bringen. Im Juli brachte er es auf 19 Abschusse und im August sogar zu 30, der vielbesagte Knoten war also auch bei ihm geplatzt. Auch der September sah einen erfolgreichen Gunther Josten, der 26 gegnerische Flugzeuge bezwingen konnte. Nach 82 Abschussen wurde er zur Luftkriegsschule Furstenfeldbruck kommandiert und er kehrte am 03.02.1944 zu seiner Staffel zuruck. Bereits 2 Tage spater schoss er 2 Boston ab und wurde, als Oberfeldwebel, mit dem Ritterkreuz des Eisernen Kreuzes ausgezeichnet. Am 02.05.1944 fiel der 90. Gegner und am 11.05.1944 wurde er zum Leutnant befordert. Am 18.09.1944 ubernahm er die 3./JG51 und am 20. erreichte er 100. Abschusse. Am 18.09.1944 schoss er als seinen 123. Luftsieg eine B-17 ab, deren Verband einen Versorgungseinsatz nach Warschau flog. Bis zu 26.10. erhohte er die Zahl seiner Abschusse auf 139. Den 150. erreichte er am 16.02.1945. Am 28.03.1945 erhielt er als Oberleutnant das Eichenlaub (Nr.810) nach 161. Luftsiegen. Am 18.04.1945 wurde er Kommandeur der IV./JG51 und am 25.04.1945 schoss er noch einmal 7 russische Gegner ab (172.-178. Abschuss). Gunther Josten gehorte zweifellos zu den besten Piloten, die nicht die Vorkriegsausbildung genossen hatten. Er wurde auf 420 Feindflugen nie selbst abgeschossen und erzielte 178 Luftsiege (bei weiteren etwa 25 nicht bestatigten). Sein ebenfalls beim JG51 dienender Bruder Reinhard fiel am 21.04.1942. Gunther blieb dem Militar auch in der Bundesrepublik treu und diente bis zum 31.03.1981 zuletzt als Oberst im Generalstab. Er starb am 07.07.2004. Als ich die Fotos von Gunther Jostens Bf 109 im Buch von Stipdonk das erste Mal sah, wusste ich, dass ich diese Szene im Modell festhalten wollte. Mit der Zeit nahm das Ganze dann etwas gro?ere Ausma?e an. In Traudl's Modellbauladen in Munchen fand ich dann noch mehrere zusatzliche Accessoirs (Figuren von Hecker&Goros und Tarmac sowie ein Pferd mit Schlitten und Benzinfassern) die ich verbauen wollte. Die Decals von Third Group Decals besorgte mir ein Freund bei Hannants und ein Cockpit-Satz von Aires fand sich auch noch an. Schon konnte es losgehen. Wie das meistens bei mir so der Fall ist, lag das ganze Zeug dann erst mal ein paar Wochen rum. Dann Cockpit einbauen. Wieder 1-2 Wochen rumliegen, da ich immer dazu keine Lust habe, was als nachstes ansteht, au?erdem habe ich immer mindestens 3 oder 4 Modelle gleichzeitig im Bau. Irgendwann konnte ich mich dann doch durchringen, das Cockpit zu bemalen. Von da an schritt das Ganze dann recht ordentlich voran. Eines abends hatte ich dann auch Mu?e die Figuren anzustreichen. Ich benutze hier absichtlich nicht das Wort 'bemalen'! Fur meine Fahigkeiten sind die Soldaten dann doch recht gut geraten, so dass ich mit dem Bau des Dioramas begann. Als Untergrund benutzte ich ein Brettchen, das beim letzten Regalbau oder einer ahnlichen Aktion ubrig blieb. Darauf brachte ich eine Lage Fugenspachtel auf (das war irgendwas fertiges aus einer Tube - Molto oder so). Da ich ja eine winterliche Szene darstellen wollte hatte ich mir Kunstschnee aus dem Eisebahnbedarf besorgt. Diesen Brachte ich auf die noch feuchte Masse auf. Dabei hielt naturlich nicht genugend 'Schnee' am Untergrund, so dass ich noch einiges mit verdunntem Wei?leim befestigte. Gleichzeitig bekamen auch die Figuren ihre Stellplatze. Nachdem auch das Modell inzwischen fast fertig gebaut war, passte ich es an die Oberflache an oder besser gesagt die Flache an das Modell. Ganz zufrieden war ich mit der Schneelandschaft mit Modell nicht. Ich habe deshalb noch etwas mit Sekundenkleber fixiertes Fullmaterial (von Greven) auf dem Diorama verteilt, insbesondere an den Stellen, wo sich der von den Flachen gefegte Schnee befinden sollte. Der Rest ist schnell geschrieben: Modell komplettieren, auf der Platte befestigen und fertig ist das Klein-Diorama. Den Schlittenzug habe ich dann schlie?lich doch nicht installiert, da mir das Diorama damit zu uberfullt schien. Steffen Arndt, Schwerins or Microsoft CFS skins we'd be delighted to host your material. Remarks: 2 Bombers. KIA 17 October, 1944 in his 'Black 1' after downing his 204th victory. He collided with a tree while pursuing a Russian Yak-7 fighter. Top scoring Ace of JG-51. 795 combat missions, including 175 close support missions. Crash landed at Mardyck on 29 March, 1941 in Wk# 3766, no cause given. Suffered severe facial wounds 5 July, 1941 combating an I-16. He was able to land without accident, with a doctor and ambulance waiting for him. On 5 July, 1942, he scored seven victories throughout the day; a MiG-1, three Yak-1's and three Il-2's. On 2 January, 1943, he was shot down in Bf 109G-2 Wk# 13985, by F/O Robt Oxspring of RAF No 72 Sq.. He broke his hand bailing, and was out of action for six months. Known to fly the Fw 190A in August, 1943. One of many Soviet multiple victories, two Il-2's (m.H.) on 29 August, 1943. A Pe-2 and two LaGG-5's ESE of Yelsk on 3 October, 1943. Two Boston III's, two Yak-7's and a LaGG-3 near Loyev on 28 October, 1943. Two La-5's on 7 February, 1944. One of many multiples, three Yak-7's, three Il-2's, and a Pe-2 on 22 February, 1944. 20 victories in the West. Anton "Toni" Hafner was born on 2 June 1918 at Erbach near Ulm located in the Wurttemberg region. After completing his training as a pilot in 1940 he joined the Erganzungstaffel JG51 (reserve flight). On 23 February 1941, Gefreiter Hafner joined 6./JG51. On 29 March he crash-landed at Mardyck. Hafner was wounded and his Bf 109 E-4 (W.Nr. 3766) was 80% damaged. Hafner recorded his first victory operating over the Eastern Front on the 24 June 1941, and by the end of the month he had added another victory to his account. He had recorded 14 victories by the end of 1941. His 25th victory was obtained on 21 March 1942. On 5 July, he claimed seven Russian aircrafts shot down to record his 35th through 41st victories. On 23 July 1942, Feldwebel Hafner shot down his 50th enemy aircraft and, on 22 August, he destroyed his 60th and received the Ritterkreuz on 23 August. Hafner was then granted leave. Hafner returned to combat duty in November 1942, by which time II./JG51 had transferred to Tunisia. Hafner, flying with 4./JG51, succeeded in destroying a RAF Spitfire fighter as his 63rd victory and his first in the Mediterranean theatre on 16 November. On 2 January 1943, II./JG51 engaged a formation of Hurricane and Spitfire fighters. In the subsequent combat, Hafner was hit probably by British ace Robert Oxspring (13.333/2/13 victories, D.F.S.) of 72 Sqn, RAF. He was forced to bail out of his Bf 109 G-2 (W.Nr. 13 985) but hit the rudder of his plane and suffered a splinter fracture of his hand. He spent six months in a German hospital as a result. He had 82 victories his credit at this time. In August 1943, Hafner returned to the Eastern Front with the Stabstaffel of JG51, a unit equipped with the Focke-Wulf 190 A. On 15 October, he shot down three Russian aircraft (98-100). On 20 October, he shot down five enemy aircraft (102-106) and five more on 28 October 1943 (107-111). He shot down seven Russian aircrafts on 22 February 1944 (126-132), his 134th on 27 March and five on 24 June (140-144). Leutnant Hafner was awarded the Eichenlaub (Nr 452) on 11 April for 134 victories. On 15 May, he took over 8./JG51 from Hauptmann Fritz Stendel (49 victories, DK) equipped with the Bf 109 G-6. On 28 June, he succeeded in bringing down his 150th victory but, two days later, his Bf 109 G-6 was hit in the engine while still over the Front. After an emergency landing he was able to return to his unit and was soon back in action. On 15th August 1944, 8./JG51 was renamed 10./JG51. He shot down seven Russian Il-2 Sturmoviks on 8 August (162-168). On 21 August, Hafner claimed Il-2 Sturmovik as his 175th victory. On 16 October, Hafner destroyed four fighters (199-202) thus taking him past the 200-victory mark. Hafner shot down a Russian Yak-7 fighter as his 204th victory on 17 October 1944. However, during the dogfight his plane hit a tree. His Bf 109G-6 (W.Nr. 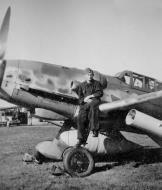 442 013) "Black 1" crashed killing Hafner, the highest scoring pilot of JG51 "Molders". Anton Hafner was credited with 204 victories in 795 combat missions. He recorded 184 victories over the Eastern Front. Of his 20 victories recorded over the Western front, eight were P-38 two engine fighters. Included in his total are 55 Il-2 Sturmoviks. 74 5.12.1942 12:03 P-38 4./JG51 10 km. S. Tebourba: 6.500 m.
75 5.12.1942 12:18 Spitfire 4./JG51 5 km. N. Tebourba: 2.200 m.
Remarks: About 600 combat missions. His first victory, a Soviet Il-2 on 3 July, 1942. An Il-2 on 6 July, 1942. A Yak-1 on 9 July, 1942. A Pe-2 on 5 August, 1942. A Yak-1 on 16 August, 1942. An Il-2 and a Fessel Baloon on 23 August, 1942. An Il-2 on 27 August, 1942. A Pe-2 on 14 September, 1942. A Pe-2 on 23 September, 1942. A Pe-2 on 27 September, 1942. Known Desert victories, both P-38's; one 25 km northeast of Siliana, the other Map Quadrant 3 East 97632, on 28 December, 1942. Another victory, a Spitfire 35 km north of Gabes on 16 January, 1943. Another, a P-38 15 km east of El Guettar on 6 February, 1943. On 21 March, 1943, he downed a Spitfire 35 km east southeast of Gabes. On 2 November, 1943, he downed a B-17 at Bad Vöslau, near Wiener Neustadt. A B-24 over Yugoslavia on 16 April, 1944. A B-24 on 6 June, 1944. A Soviet La-5 on 5 December, 1944. A captured Bf 109 on 11 December, 1944. A Yak-9 on 21 December, 1944. Bowers/Lednicer, 36 victories. Remarks: KIA 12 March, 1945, shot down in his Fw 58 by British fighters while on a courier flight near Haderslev Denmark. Obermaier identifies this AC as Bf 109G-14 Wk# 464454, not the Fw 58 Courier AC. 'Air War over Denmark' also identifies the AC as Bf 109G-14 Werk # 464454, on an intercept mission, and that the victors were American P-51's. Shot down twice over the English Channel and rescued by German submarines. His 1st aerial victory was a Blenheim over the English Channel on 29 April, 1941. His 2nd, a Hurricane E of Ramsgate on 21 May, 1941. His first known Soviet victory, two DB-3's on 25 June, 1941. Another double victory on 1 July, 1941; an I-16 and a Vultee-11. An I-18 and two Pe-2's on 30 August, 1941. An I-16 on 1 November, 1941. Two MiG-1's on 7 July, 1942. A Pe-2 and and two Il-2's on 4 August, 1942. On 3 February, 1944, Mink was shot down and seriously injured in an attack on B-26 Marauders in his G-6 Wk# 160757. 70 victories in the East. After returning to combat status, his first victory, an Il-2 on 1 September, 1944. An Il-2 on 22 September, 1944. Bowers/Lednicer, 72 victories. Remarks: One known victory, a B-26 at lake Vico Italy on 16 January, 1944. Magnus Report, 5 victories. MTO - TACTICAL OPERATIONS (12AF): In Italy, B-25's bomb the marshalling yard and choke points at Terni; B-26's attack the marshalling yard and bridge at Orte; A-20's bomb the town of Atina; P-40's attack bridges in the San Giorgio del Sannio area and gun emplacements near Cassino; Sant' Angelo in Theodice and Picinisco; A-36's hit the railway junction at Cecina, road and railway S of Siena, and the town areas of Avezzano and Formia. Remarks: Reported lost in Russia on 2 August, 1942, cause and location not reported. He returned later and Wk# 8992 was recovered. His first known Soviet victory, A SB-2 on 25 June, 1941. Another Soviet, a DB-3 on 3 July, 1941. An I-16 on 31 July, 1941. A Pe-2 on 9 August, 1941. An I-61 on 22 August, 1941. A double Soviet victory on 25 August, 1941; both DB-3's. An I-61 on 29 October, 1941. An I-61 on 18 February, 1942. A Pe-2 and a Yak-1 on 5 August, 1942. An Il-2 on 22 August, 1942. Two Il-2's on 23 August, 1942. An Il-2 on 27 August, 1942. Two Il-2's on 14 September, 1942. A N. African victory, a Beaufort 22 km northwest of Bizerta on 17 November, 1942. Another, a P-40 during a ground strike at Quadrant 80 492 on 21 May, 1943. Magnus, 23 victories. MIA 6 July, 1944 after being shot down during aerial combat with a P-51 in the Munich area. His first known victory, a Soviet LaGG-3 on 5 July, 1943. A LaGG-5 on 8 July, 1943. Two MiG-3's on 10 July, 1943. An Il-2 (m.H.) on 3 August, 1943. An Il-2 (m.H.) on 4 August, 1943. A Boston S of Schablojkino and an Il-2(m.H.) E of Malaja-Tsmenowka on 5 August, 1943. An Il-2 (m.H.) E of Mirgorod on 27 August, 1943. An Il-2 S of Novo-Alexandrovka on 29 October, 1943. A Pe-2 on 27 March, 1944. An Il-2 on 7 April, 1944. An Il-2 on 10 April, 1944. A Yak-9 on 27 April, 1944. An Il-2 on 28 April, 1944. A Pe-2 on 30 April, 1944. A Yak-9 on 1 May, 1944. A LaGG-5 on 3 May, 1944. A P-39 on 10 May, 1944. Victory numbers incorrect!! His 10th victory, a P-51 at Plattling on 9 June, 1944. A B-24 by Weidenbach on 13 June, 1944. A P-51 E of Pressburg/Bratislava on 16 June, 1944. A 13th, a P-51 at Pressburg on 26 June, 1944. His 14th, a B-17 at Budapest on 27 June, 1944. No. 26, a P-51 NW of Mor/Raab on 2 July, 1944. Magnus, 28 victories. His June 26, 1944 victory is reported as Victory #27 by the Perry Claims, so 28 is probably correct. Horst Petzschler was born on 1 September 1921 at Berlin. He completed an apprenticeship as a toolmaker with Henschel Flugzeugwerke A.G. at Schonefeld after leaving school in April 1938. He was also active flying gliders. Petzschler joined the Luftwaffe on 1 April 1941. He spent five months receiving military training before reporting to Flugzeugfuhrerschule A/B 10 at Grottau. Having qualified for his pilot's licence, Unteroffizier Petzschler entered the flying schools at Oels and Ohlau to qualify on multi-engine aircraft following which he was transferred to the pilot training school at Prenzlau as an instructor. On 7 March 1943, he was assigned to JG105 at Villacoublay near Paris for fighter pilot training. 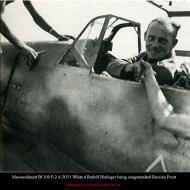 Petzschler completed his final training on the Fw 190 A-2 near Toulouse, France. Petzschler was posted to JG51, where he was assigned to the Geschwaderstab, based at Smolensk, arriving there on 23 August 1943. On his first mission on 7 September, flying as wingman to Feldwebel Anton Hafner (204 victories, RK-EL, killed in action 17 October 1944), he was shot down by Russian flak and baled out. His primary role was Jagdbomber tank busting, however he was also often involved in aerial combat and claimed his first victory on 11 May, when he shot down a Russian Yak-7 fighter near Nevel. He had completed 126 fighter-bomber missions and had three victories to his credit when he was advised of his transfer to the Western front. Petzschler was to 2./JG3, based at Burg in Germany, on 13 April 1944. On 12 May, he flew his first mission against the USAAF when he was scrambled to intercept an incoming raid. In the subsequent aerial combat southeast of Frankfurt, Petzschler claimed a B-17 four-engine bomber Herausschuss and an escorting P-51 fighter shot down. However, he received hits from other P-51 fighters necessitating a forced-landing near Fritzlar. He was shot down again a few days later when, attempting to intercept a large formation of USAAF four-engine bombers heading for Berlin, he was intercepted and shot up by USAAF P-38 twin-engine fighters necessitating another belly-landing. On 28 May, he shot down a USAAF P-51 fighter near Magdeburg but was then again shot down himself. He baled unhurt near Rothensee. Reassigned to JG51 in June 1944, Petzschler was reassigned to the Geschwaderstaffel, based at Minsk. He recorded his 10th victory in July when he shot down a Russian Yak-9 fighter near Wilkowischken. In September, Petzschler was transferred to the Fighter Pilot School at Liegnitz as an instructor. He returned to the Geschwaderstaffel of JG51 on 13 February 1945. He recorded his 20th victory in March, when he shot down a Russian Il-2 ground-attack aircraft near Zinten. On 1 April, he received promotion to the rank of Fahnenjunker-Feldwebel. He had taken his victory total to 26 when, on 4 May 1945, III./JG51 were ordered to leave East Prussia for Schleswig-Holstein. However, Petzschler, due to navigational problems and a damaged fuel tank, make a dead-stick landing at Bulltofta in neutral Sweden because he had run out of fuel. The Swedish authorities interned Petzschler. In January 1946, Sweden handed Petzschler over to the Russians who imprisoned him. He was eventually released on 22 September 1949. After six months recuperation, Petzschler joined the Berlin police force. However, he soon returned to aircraft manufacturing, his pre-war profession. In 1951, he gained employment with British European Airways. In 1953, he and his family immigrated to Canada. There he worked as an auto mechanic before moving to the United States. In the US he started to work in the aircraft industry. He has worked for Boeing, Lear, Northrop and Beechcraft. He finally retired in 1988. Horst Petzschler was credited with 26 victories in 297 missions. He recorded four victories over the Western front, including two four-engine bombers. Petzschler was shot down 13 times during his combat career, baling out twice due to enemy fighters and shot down 11 times after receiving flak damage making 11 forced landings.